the GLAA's newest and most popular endeavors? 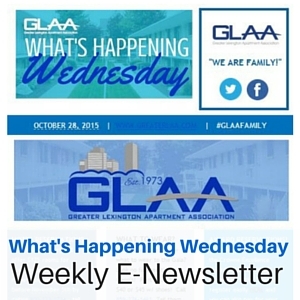 Each week, the GLAA office sends out an E-Newsletter called "What's Happening Wednesday" to our subscribers! Your sponsorship would come in the form of an ad sized 960X150 pixels and would appear after the Event Updates for the month. Members LOVE this weekly snapshot of what is happening within their association and the email boasts a very high open rate for email newsletters via iContact. 12 Times for $275 | Savings of $25! 52 Times for $1,000 | Savings of $300! Space is limited on the number of sponsors per E-Newsletter. Once the spots are filled the sponsorship will no longer be available. Don't delay, get your contract to the GLAA today! at 859-277-9187, or by mail at 2265 Harrodsburg Road, #350, Lexington, KY 40504.